Valentine’s Day is just around the corner and while there are the usual flowers, candy, and gifts some us like to celebrate with a nice meal. This is not to say you have to splurge at a fancy restaurant and spend a fortune! Not at all! Why not enjoy a nice romantic dinner at home? And, before you say it – no one wants to be stuck in the kitchen cooking on Valentine’s Day! 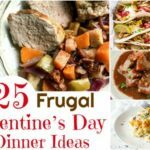 We have 25 EASY & Frugal Valentine’s Day Dinner Ideas your sweetie is sure to love! The best part is they are easy and some are even make-ahead dinners! The very best part is they don’t cost a fortune!